Very effective cover by Norman Saunders. It's supposed to be bad luck to have a woman aboard a fishing boat. This is apparently true even if the woman is dead--hidden aboard after her fisherman husband murdered her. Those Darn Revolvers Just Bug Me! But there are limits to this--moments in which the historical inaccuracy jumps the film over that amorphous line where the Suspension of Disbelief ends. 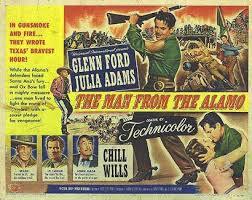 Let's look at the 1953 film The Man from the Alamo. Glenn Ford is a man named John Stroud, who is part of the garrison at the Alamo in 1836. He and four other men learn that some Texas renegades on Santa Anna's payroll are killing and looting near their home town. They draw lots to decide who will go to protect their families. Stroud "wins." Well, he's too late to help the families and the Alamo falls before he can get back. So now pretty much everyone in Texas thinks he's a traitor. But that's the least of his problems. His primary task is to bring the renegades who killed his family to justice--and save a wagon train full of women and children in the bargain. It's a really good movie. Like all Westerns directed by Budd Boetticher, it looks great and the action scenes are exciting. The final battle, with Stroud, a one-armed old man and a half-score of women battling the renegades, is fantastic. The story has a four-act structure. Act 1 is the Alamo; Act 2 is Stroud discovering his family is dead and that everyone in Texas is ready to lynch him for his perceived cowardice; Act 3 involves him pretending to join the renegades; the final Act has him joining and then eventually leading the wagon train. Events lead Stroud from one act to the next in a smooth and logical manner. Along the way, the theme of duty vs. family is revisited--we can honestly debate whether Stroud was right in leaving the Alamo, or whether another character is right in his decision when faced with a similar dilemma late in the film. Stroud himself claims he was wrong to leave, but someone else jumps to his defense. It's an interesting and sincerely delivered debate on moral responsibilities. The cast is superb. Ford gives an understated performance as Stroud, showing emotion without allowing the emotions to leak over into melodrama. 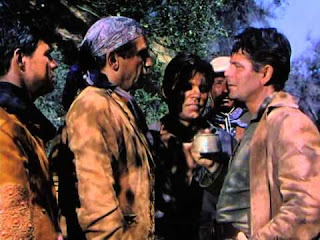 Victor Jory and Neville Brand are the primary bad guys--and any movie with either of those two playing bad guys immediately jumps up a few notches in quality. Because it tells such a great story, I'm not at all bothered by most of the historical inaccuracies in the film. The incorrect layout of the Alamo or Travis' age (the actor playing him is 25 years too old) are all beside the point in this case. This is a mythic Wild West version of the Texas War, so it doesn't have to be accurate to history in most ways. I'm even okay with the fact that everyone is dressed like a cowboy from the 1870s or 1880s. Heck, it's Texas in the Old West. They're supposed to dress like that and the heck with what history says! But, by golly, the revolvers that everyone carries bug me to no end. The rifles are okay--they are muzzle-loading flintlocks that would have been common in 1836. But the pistols also should have been flintlocks, with perhaps a few percussion cap weapons mixed in. There would not have been any six-shooters. But everyone in this movie who uses a handgun uses a six-shooter. For me, this is just one step too far over that Suspension of Disbelief line. It bothers me the way it would bother me if a King Arthur movie armed the Knights of the Round Table with tommy guns. On the other hand, I'm not bothered by most King Arthur stories tossing in castles, plate armor and codes of chivalry that are several centuries too early to have been around in Arthur's time. Because that's what the Days of King Arthur are supposed to look like and the heck with what history says! So I fully realize I'm being inconsistent in what I do or do not find acceptable. The Man from The Alamo is an excellent Western in every respect except those revolvers--and whether or not the revolvers bother you is a completely subjective thing. They do indeed bug me, but they might not bug you at all. You know--come to think of it---Arthurian knights wielding submachine guns. That actually sounds kinda cool, doesn't it? 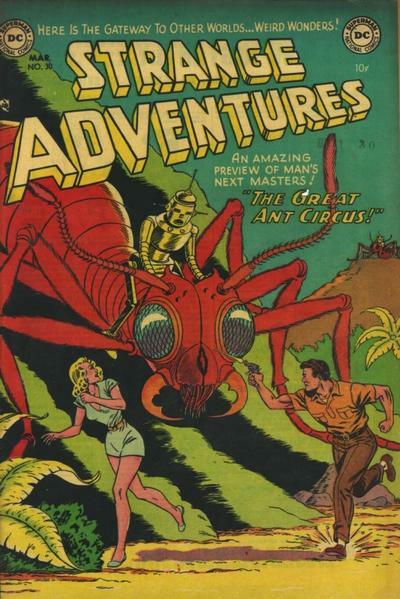 The cover for Strange Adventures #30 (March 1953) was drawn by Murphy Anderson. I wish I knew the history behind it. The issue itself has an 8-page Captain Comet story, a 6-page non-series story, and a 4-page story highlighted by the cover. So editor Julius Schwartz decided that the shortest story in the book should be used to sell it. 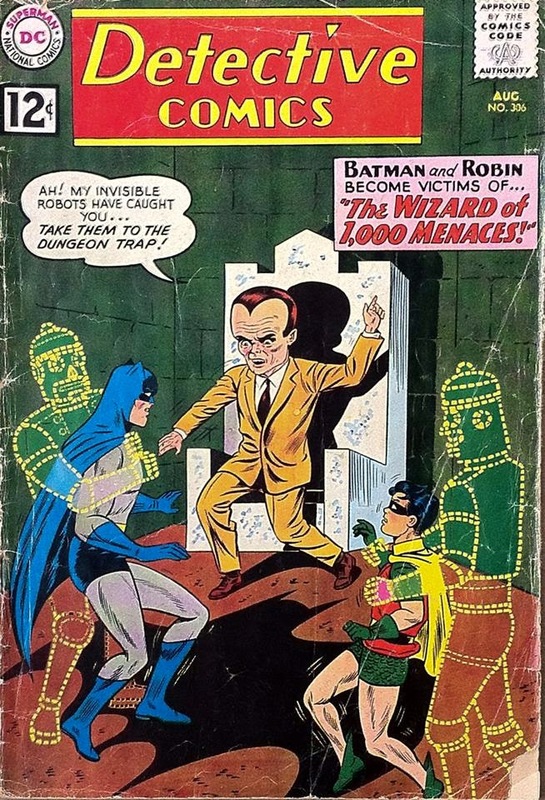 Or perhaps Anderson drew the cover image, then Anderson and writer Gardner Fox had to come up with a story that fit it. Whatever the exact circumstances, it is an epic cover. It's a robot riding a giant ant while chasing two frightened humans. Who wouldn't buy this comic book? In fact, when I give talks to elementary school kids about the history of comics, I show this cover to highlight the science fiction stories of the 1950s AND do an exercise in which the kids have to call out story ideas that would match the cover. That part is always great fun. 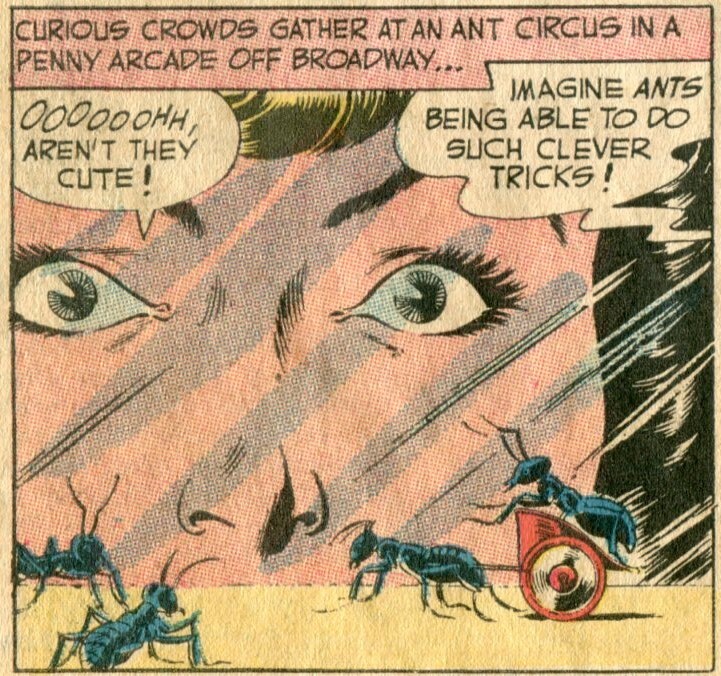 The actual story involves Bill and Ann Hanley, who are making good money running an ant circus, in which the trained insects do various tricks for the audience. But remember that this story is only four pages long, so weird stuff (weirder than huge crowds paying money to see an ant circus) happens pretty quick. Bill and Ann are walking in the woods when they see a rocket ship land. Giant ants being ridden by robots charge out and captures them. The robots explain what's going on. They work for the ants, who are intelligent. How they build robots without themselves having opposable thumbs is not discussed. The ants need a couple of humans. Why? Well, if humans can have an ant circus, there's no reason why ants shouldn't get to have a human circus. Oh, heck. 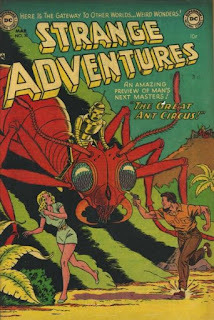 The story is an excuse to have a cover featuring a robot riding a giant ant. It doesn't need a reason beyond that. It is significant justification in of itself. 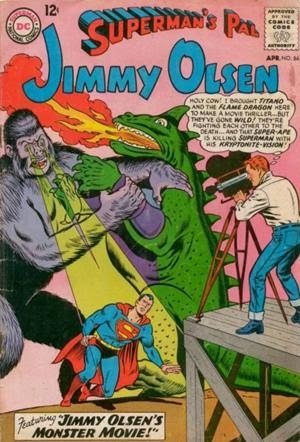 So Jimmy gets a chance to film a monster movie and his idea is to lure two REAL monsters together and get them to fight. Gee whiz, Jimmy, that's a great plan! What could possibly go wrong? John Bareby is determined not to allow his mentally handicapped son to be put in an institution, even after a court orders this be done. So he and the boy go on the run. There's a great twist ending to this one. You know, I think you can argue that Edmond Hamilton had too many good ideas and didn't always spread them out as much as he should have. 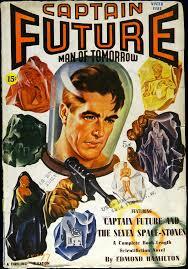 I would hold "Captain Future and the Seven Space Stones" (Winter 1941) up as evidence of this. The 5th Captain Future adventure is crammed to overflowing with wonderfully imaginative ideas, but there simply isn't time within this relatively short novel to properly develop all those ideas. The plot here is different in one important way from the previous four Captain Future adventures. Previously, the identity of the main villain was unknown, with there being a number of suspects to choose from. This time, we know who the bad guy is right from the start--Doctor Ul Quorn, a Martian/Venusian/Human hybrid who once went to prison for performing horrible experiments. Now he's free and trying to acquire the Seven Space Stones, relics of an ancient Martian scientist and the key to a mysterious super-weapon. 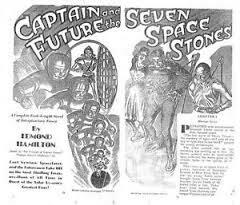 The mystery here is two-fold: What can Ul Quorn do with the Space Stones if he acquires them all and why does he seem to already have a grudge against Curt Newton (aka Captain Future) and the Futuremen? This premise leads into a competing treasure hunt, with Ul Quorn and Captain Future each trying to get the Space Stones before the other does. 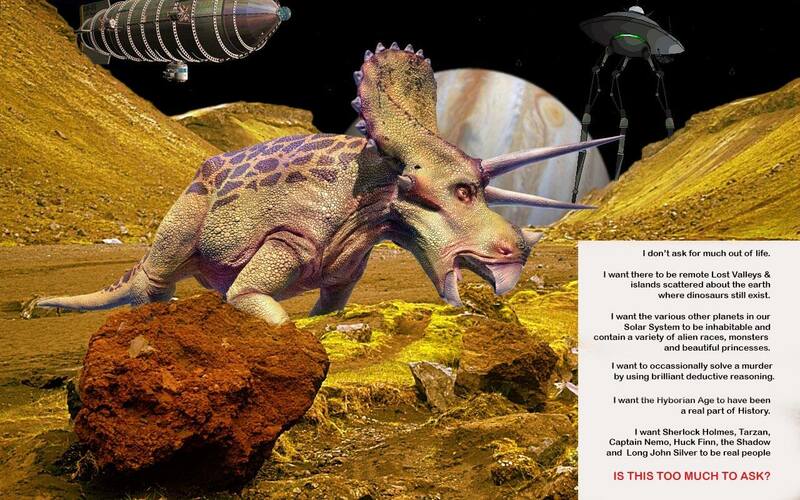 It's a race that takes them from Earth to Venus to Mars to an outlaw asteroid called the Pleasure Planet. 1. Ul Quorn is traveling with an interplanetary circus, using his scientific skill to put on a magic act. His minions (aside from a mind-numbingly beautiful Martian femme fatale) are genetically-engineered members of the circus freak show whose skills come in handy when its time to steal a Space Stone. For instance, one guy has enlarged cup-like ears that give him super-hearing, while another has a chameleon ability to change his skin color and blend in with the surroundings. 2. Captain Future at one point encounters a space hermit who despises technology and lives on a remote asteroid. 3. Another asteroid, the Pleasure Planet, is outside planetary police jurisdiction because the crook who owns it slapped some huge rockets on it and stopped its orbit, thereby using a legal technicality to become a world outside the law. 4. The effects of the super-weapon and the final fight this leads to are cool and awesome and absolutely epic--but I can't tell you about it in detail without spoiling the surprise for anyone who hasn't read it. 5. Since the Futuremen have no evidence against Ul Quorn at first, they go undercover at the circus in various disguises. Grag the robot's disguise and the personality he assumes is hilarious. 6. Ezra Gurney, the aging Space Marshall who is one of Curt's regular allies, has a legitimately touching encounter with an aging space pirate he had tried to catch years before. 7. There's a cult of Martians who are determined to bring back the scientific glories of their planet that were lost 2000 centuries ago. 8. Did I mention that there's a mind-numbingly beautiful Martian femme fatale? All this makes "Captain Future and the Seven Space Stones" the most fun of the first five books in the series. But, ironically, it also borders on being unsatisfying. The above ideas simply aren't fleshed out as much has they might have been. For instance, several of Ul Quorn's "freaks" assist him, but several others are simply introduced, described well enough to wet our interest, then left unused. The coolest of them is probably the Moon Wolf, a six-legged wolf from Io who had a human brain transplanted into it, giving it intelligence and the power of speech. You simply do not introduce us to a six-legged talking wolf from Io and then not do anything with him! I was expecting a fight between the Futuremen and the freaks, but we never get to see this. The Hermit, the femme fatale, Ezra's former space pirate nemesis, the Martian cultists--all these are interesting characters. All are underused. Other plot points come and go too quickly. At one point, Captain Future and Planetary Police agent Joan Randall are undercover in the gambling dens on Pleasure Planet. The normally straight-laced Joan is posing as a spoiled rich girl, which is a fun idea. But we get only one line of dialogue from her while playing this role, then the story moves on to other things. There are two more important items to bring up. Ul Quorn is taken alive at the end--I think he's the first major villain in any of the stories to be taken alive. This is because his back-story and his scientific genius are setting him up to become Captain Future's re-occurring arch-enemy. I have no complaints about this. The hybrid mad scientist is a great villain. Also, Otho the Android gets a pet. This is a "meteor mimic"--a small animal that can shape-change--which Otho names Oog. Remember that Grag the robot had a metal-eating "moon pup" named Eek. 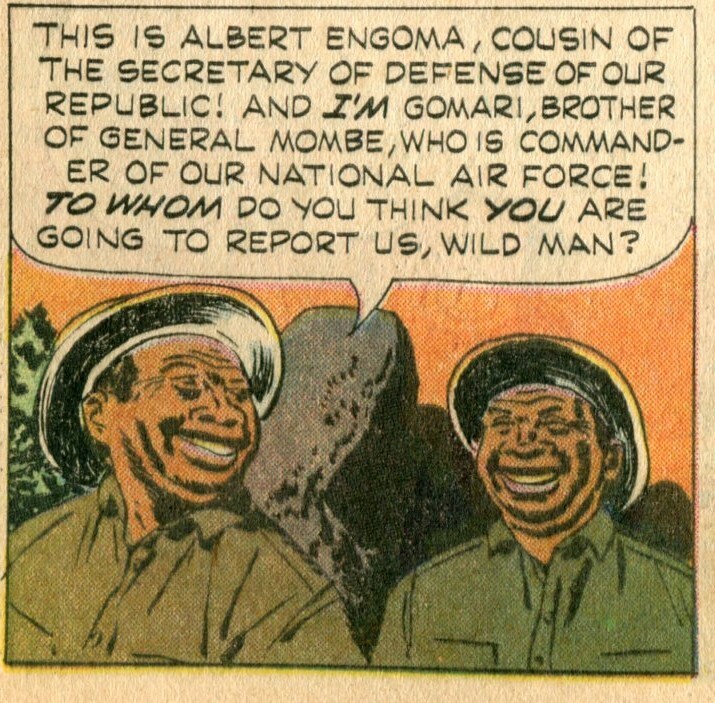 Remember also that Grag and Otho are always arguing--mirroring Ham and Monk from the Doc Savage novels. Giving both a pet further mirrors Ham and Monk, who had an ape and a pig respectively that they employed to annoy each other. 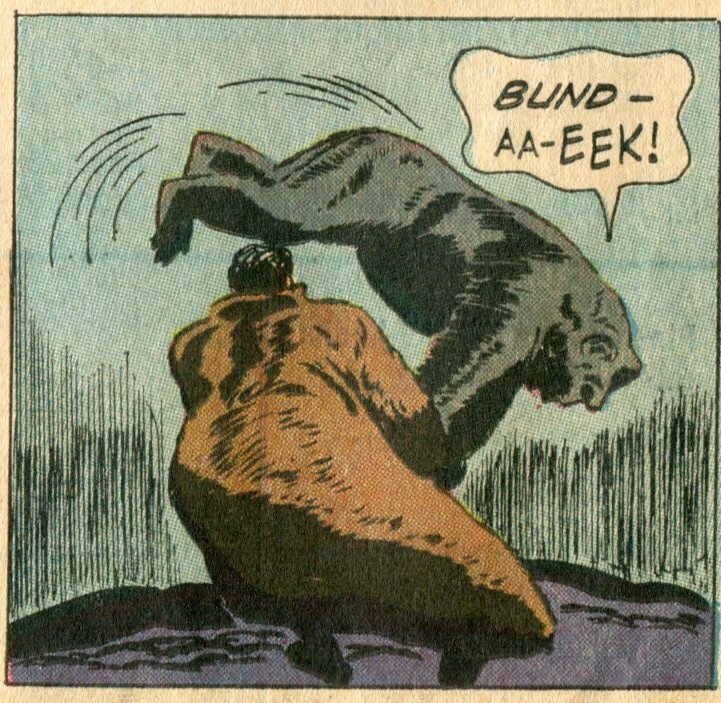 That Hamilton (perhaps under editorial order) was deliberately lifting this dynamic from Lester Dent's Doc Savage tales becomes even more apparent when Oog is tossed into the mix. I'm a bit conflicted about this. 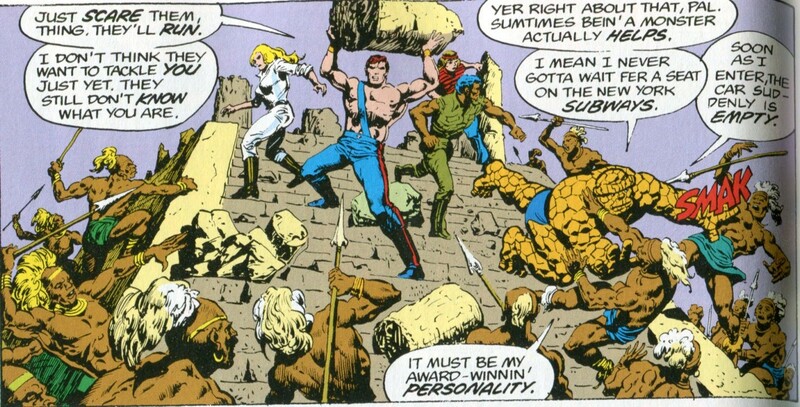 As much as I love Hamilton's work as a writer, I would have preferred to see the Futuremen develop their own unique personalities. 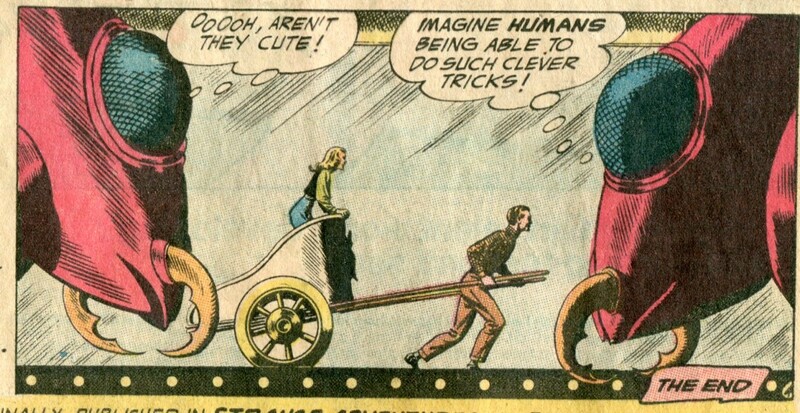 On the other hand, Oog and Eek are pretty cool. But "The Seven Space Stones" is still a great story. Reading this one leaves you very aware of just how well-qualified Edmond Hamilton was to eventually switch to writing comic books and produce so many great Legion of Superheroes and Superman tales. That same sense of pure fun and internally consistent logic is there. Heck, Captain Future and his men would have fit into DC's Silver Age universe perfectly. There are 15 more Captain Future novels and 5 short stories, so there's a good chance we'll talk about him again in the future. But that's it for Captain Future as a part of the "In Order" series. 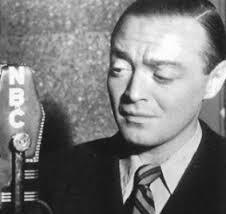 We still have two Perry Mason movies to go and we'll also get back to Jongor of Lost Land for his last two stories. After that--well, as of this writing (about two months before it posts) I haven't decided yet. This epic cover (painted by George Wilson) actually fibs to us a little bit. 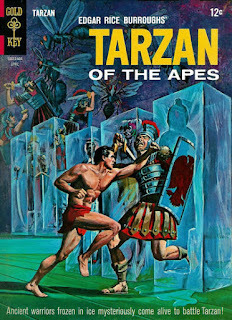 In Gold Key's Tarzan of the Apes #149 (April 1965), the Jungle Lord does find an ice cavern full of frozen ancient warriors, but he doesn't actually fight any of them. Jesse Marsh, "The Secret of the Frozen Caverns" starts with a rather brutal bang. Two poachers in an airplane are shooting animals from the air, including an ape named Mogok, leaving his mate to grieve his death. Tarzan stows away on top of the plane when it lands to harvest tusks off a dead elephant. 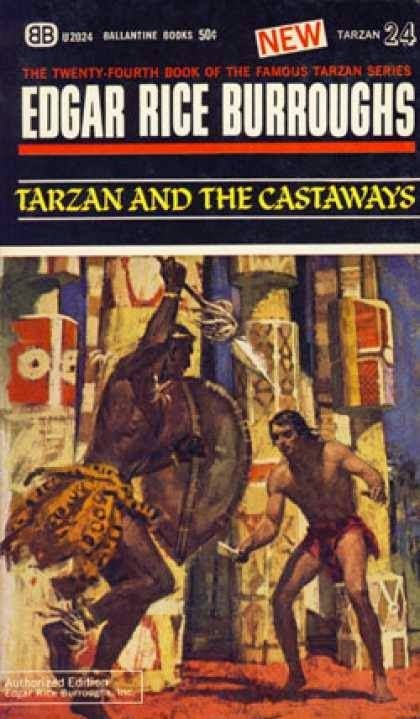 When the plane is forced down by bad weather, it lands near a lost civilization--because Tarzan is incapable of travelling anywhere without stumbling across lost civilizations. The poachers, by the way, die off-screen a little later in the story--because the main focus of the story will shift to something else. But there is an interesting scene concerning them first. After the plane lands again, Tarzan announces his plans to turn the poachers over to their government. The two men laugh at him--it turns out they are relatives of important government officials and free to whatever they want--legal or illegal. The scene seems to be an acknowledgement of the often open corruption that has plagued real-life Africa pretty much forever. But then the two are hauled out of the main plot and there's no follow-up. It might be that Gaylord Du Bois wanted to counterpoint the corruption of the outside world with the utopia Tarzan has discovered. Because the Xung people have discovered a life-prolonging serum using the venom of giant wasps (Their king, Kwai, walks around with one of the wasps perpetually sitting on his head.) They've also achieved mastery of many languages, send their people to the outside world for advanced education, and defend their land against invaders by using the wasps to sting enemies unconscious. They then place invaders in suspended animation in their ice caverns, letting a few out every so often to see if they can find satisfaction working among the Xung. Since this book was published in 1965, it really is remarkable that the advanced and peaceful Xung are black Africans and not some long-lost white race. But a few of them do seem to be lacking in common sense. Kwai ordered the poachers' plane to be moved out of sight. While Kwai is showing Tarzan the ice cavern full of frozen soldiers, some of his people decide to move the plane by tossing it off a cliff. The gas tank explodes and seals up the cavern. Kwai suggests they use wasp venom to go into suspended animation, otherwise they will soon freeze to death. But Tarzan notices a hole in the cavern roof high above. 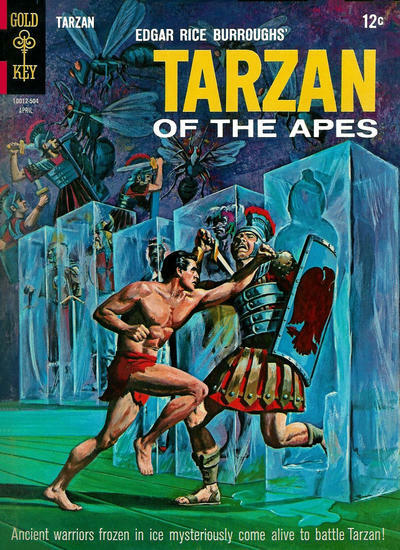 They've already thawed out an ape whom Tarzan wants to fix up with the she-ape who lost her mate at the beginning of the story. Together, the two men and the ape manage to climb up and out the hole. The climbing sequence is the highlight of the story, as is the characterization of the ape. Though intelligent enough to have a primitive language, Burroughs' apes were a bit on the dense side. Tarzan has to wrestle the ape into submission to get him to help. 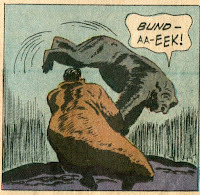 Later, the ape misunderstands an order and throws a badly-needed rope off a cliff. The scene feels just right for Edgar Rice Burroughs' version of African apes. I don't know if Tarzan ever returned to Xung in later stories. I suspect not--and a character search in the Grand Comics Database seems to confirm this. "The Secret of the Frozen Caverns" is a good story, but Xung is little too peaceful and idyllic. This makes it a lot less interesting that lost civilizations where wars are fought or palace intrigues are carried out. Peace and tranquility are worthy goals in real life, but they don't belong in an adventure story. A really strong cover painted by Robert Abbott. 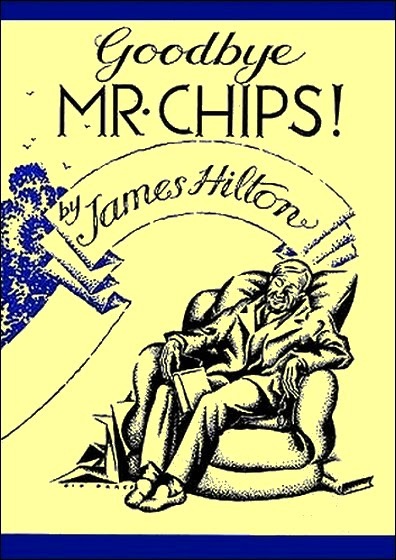 Hebert Marshall is excellent in this faithful and heartfelt adaptation of James Hilton's novel. President Garfield, Robin Hood and John Wayne. John Wayne did tons of B-Westerns and serials during the 1930s, before finally hitting the big time with Stagecoach in 1939. One of regular gigs was playing Stony Brooke--one of the 3 Mesquitteers. 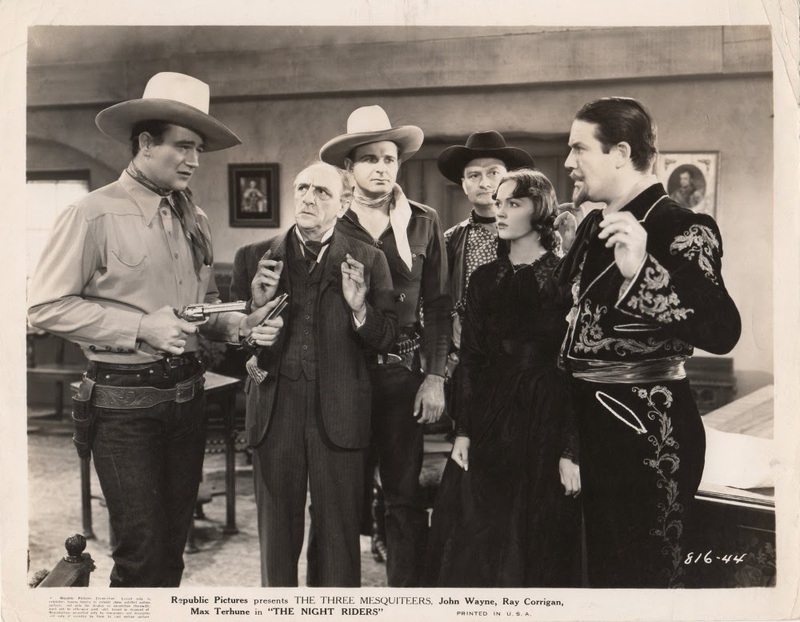 Wayne played Stony in 8 of the 51 films in this popular series. 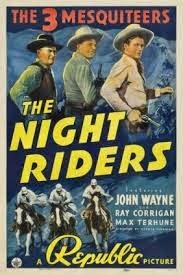 One of these films 1939's The Night Riders and it is one of my favorites. The villains this time out are a forger and a crooked gambler (who is also a former actor). The two team-up to respectively forge a document and assume the identity of a Spanish noble. This allows them to claim ownership of millions of acres. They then begin to tax the pants off the homesteaders and ranchers already living on that land. This leads to the Three Mesquitteers losing their ranch. This in turn leads them to assume masked identities, becoming "Los Capaqueroes," masked vigilantes who rob from the villains' tax collectors and return the money to the homesteaders. I really enjoy the story, especially the Zorro and Robin Hood influences that are so effectively used. There's also a number of fun twists and turns in the plot, such as when the boys take a job with the bad guys and are tasked to catch themselves. Another plot twist involves a cameo by President James Garfield--not a president you see portrayed very often in films. (Without researching it at all, I'm going to guess that Lincoln followed by FDR are the most commonly seen Chief Execs we see in the movies.) Garfield's assassination, by the way, proves to be an important plot point. It's also just plain fun to see John Wayne in what it essentially a superhero costume. 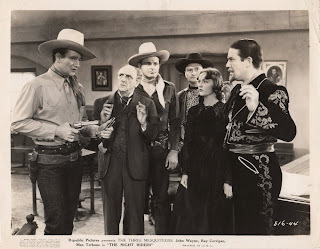 Tom Tyler (who himself would be playing superheroes such as Captain Marvel and the Phantom) is an evil henchman, while future Frankenstein's monster Glenn Strange has a small role at the beginning. 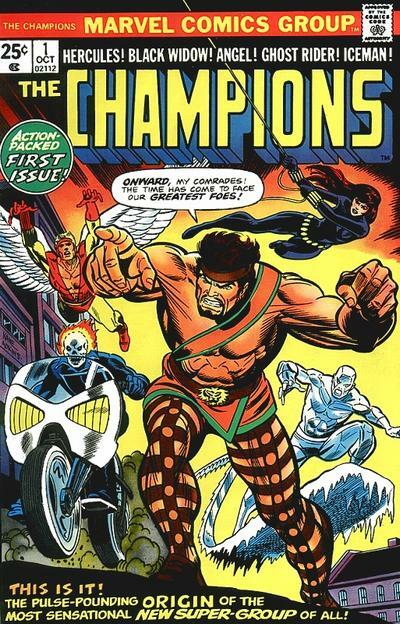 The Champions was a fun series. It came into existence in 1975 and seemed to have been created to randomly toss together established heroes who (with the exception of Ghost Rider) were not being used elsewhere. Hercules and Black Widow were not active with the Avengers at that time. Angel and Iceman had recently left the X-Men when the new team members had been introduced. Tossing Ghost Rider on a team seems odd (and his presence was sometimes a little awkward in the series), but what the hey. Every superhero (or cursed-by-the-devil stunt cyclist) should have a chance to join a team, right? 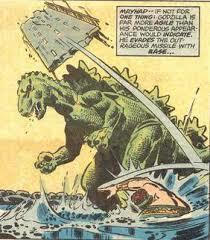 It ran for 17 issues, plus a guest-star appearance in Godzilla. 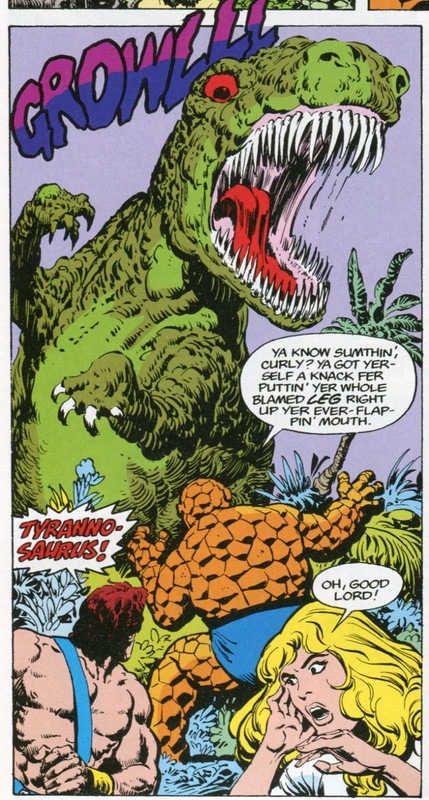 That Godzilla issue, by the way, contains one of single most entertaining moments in comic book history. The Champions are in San Francisco, trying to drive off the big monster. The Golden Gate bridge is damaged and Hercules throws a chunk of it at Godzilla--only to miss and accidentally knock a SHIELD helicarrier out of the sky. An ongoing plot point in The Champions involved their headquarters--an L.A. skyscraper built with Angel's family fortune. The contractors used shoddy materials, so the security system was always either failing or actively trying to kill the heroes. The 17th issue ends with the Champions defending their HQ against Sentinels, who had pursued some frightened mutants into the building. The robots are defeated, but then that's it. The series is cancelled. 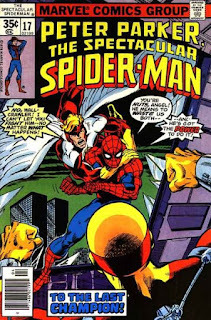 But writer Bill Mantlo was able to borrow Spider Man for a brief time to finish up the Champion's story. In Peter Parker, Spectacular Spider-Man #17 (April 1978), Peter is sent to L.A. to get pictures of the break-up of the Champions. So obviously something has happened off-stage. Angel--the only one left at the headquarters--explains that the various heroes suddenly decided it was time to move on for various personal reasons right after the Sentinel fight ended. Only Angel stayed, hoping to reform the group, only to discover that "the world does just fine without us." It's actually a bit abrupt and not completely satisfying for anyone who had enjoyed The Champions. Another option might have been to have the Champions still together, teaming up with the webslinger, and allowing the events of the story to convince them it was time to call it quits. 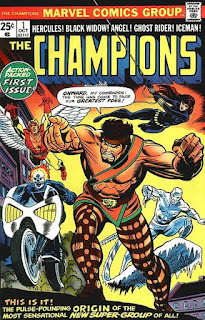 Or perhaps the Champions could have stayed together, available to pop up in other books when a writer wanted to use them. This second option, though, might have limited the availability of the individual characters to appear as needed. Angel, for instance, played a role in the X-Men's Death of Jean Grey story arc a short time later. Also, readers of a Spider-Man book are looking for a story that revolves around Spider-Man, so turning it into a Champion story (a book many of the readers probably hadn't been following) would admittedly have been a little unfair. Oh, well. Bill Mantlo is incapable of writing a story that doesn't entertain you at some level. 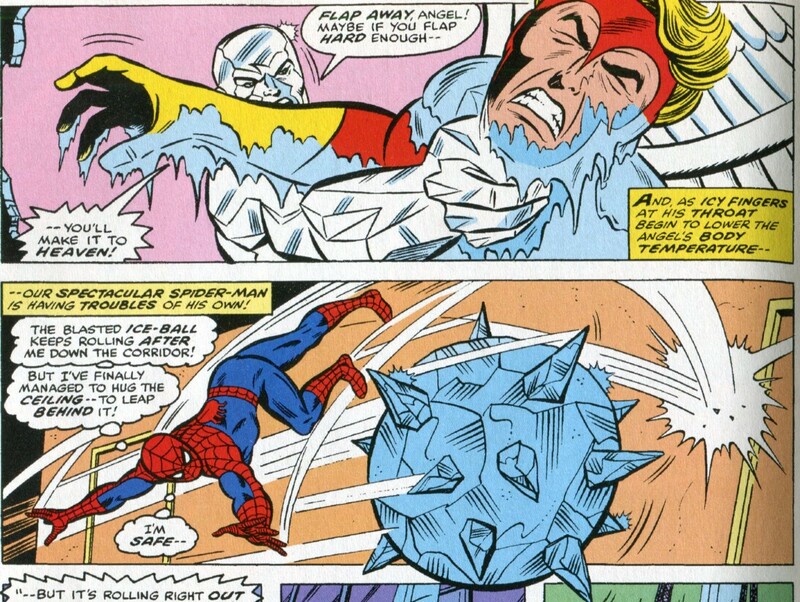 The ensuing story involves more shenanigans with the malfunctioning HQ, plus a villain who has mind-controlled Iceman to get belated revenge on the Champions. This leads to a great fight scene illustrated by Sal Buscema. 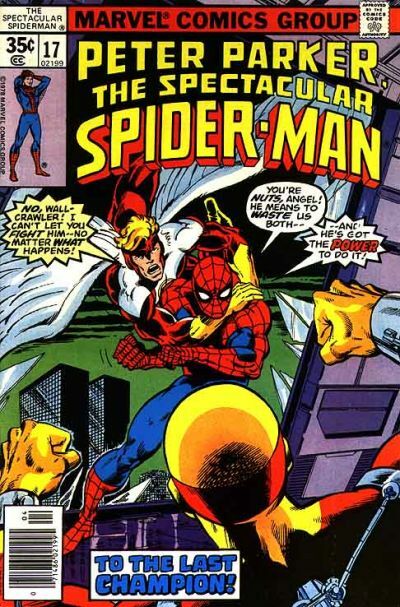 It begins in Peter Parker #17, with Iceman's identity initially concealed from both Spidey and the readers, then concludes in issue #18. 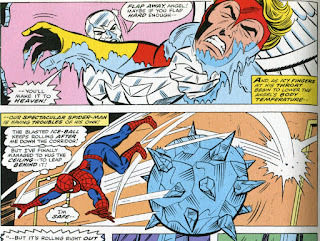 Iceman's identity is revealed, but the mind-control makes him hate Angel and Spider-Man to the point of wanting to kill them. And the story does a pretty good jog of pointing out just how powerful Bobby Drake can be if he isn't worried about hurting people. 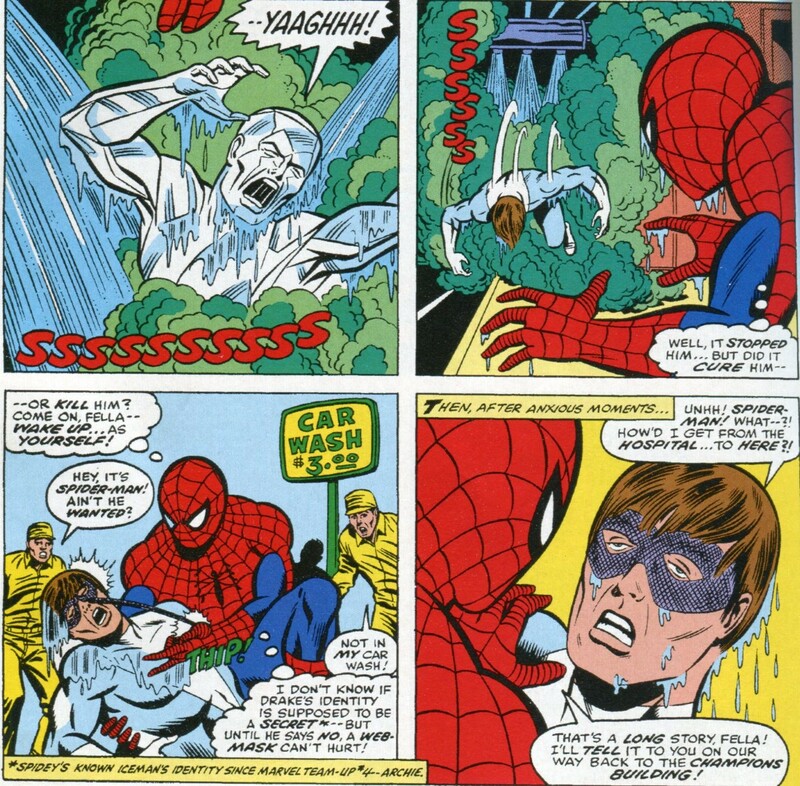 In an inspired tactic, Spidey breaks the mind-control with a sudden shock--caused by carrying Iceman out of the building and into the scalding heat of a nearby car wash. The bad guy is defeated and Angel sics his lawyers on the building contractors. 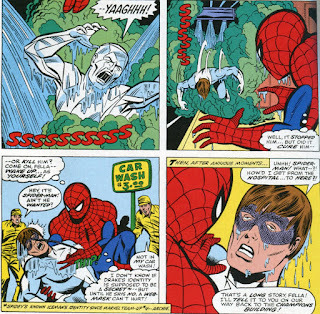 I also enjoy a moment in which Spider-Man isn't sure if Bobby Drake has a secret identity, so provides him with a web mask so that no one will recognize him coming out of the car wash.
So,though Peter Parker #17 & #18 doesn't really give us an emotionally satisfying end for the Champions, it does give us a cool fight scene and remind us of the importance of always knowing where the nearest car wash is located. That guy is seriously creepy-looking! A private detective from the East is tracking down a missing Englishman who is heir to a family fortune. The Ranger is simultaneously tracking down a murderer and crooked gambler. It won't be long before their respective paths cross. 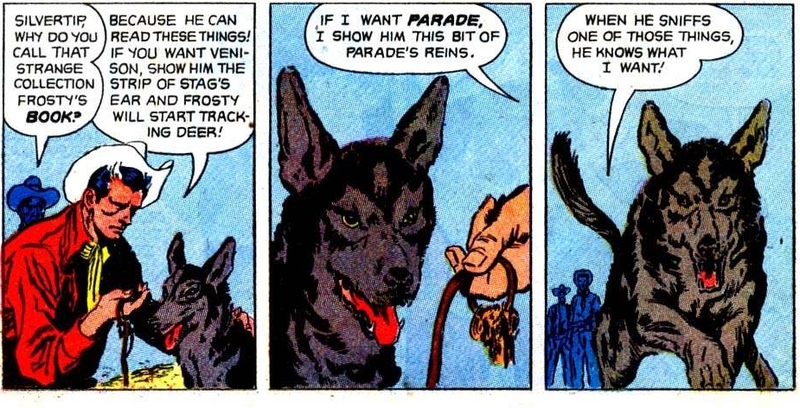 Max Brand apparently liked the idea of teaming up a man with a horse and a wolf. He did it in the Whistlin' Dan Barry books--Dan's horse was named Satan and his wolf was Black Bart. Dan, though, only lasted for three books (written between 1919 and 1921) before his story came to a end. 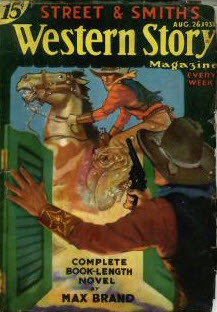 Brand returned to the idea with a more traditional hero in the 1930s, with a series of tales published in Western Story Magazine. These were expanded and reprinted as novels during the 1940s. The protagonist this time was a wandering cowboy named Jim Silver, who (though still a young man) had two streaks of gray hair at his temples. Thus his nickname Silvertip. He wandered around the West with his horse Parade and his wolf Frosty, foiling bad guys, protecting the innocent and building up a Lone Ranger-like reputation. 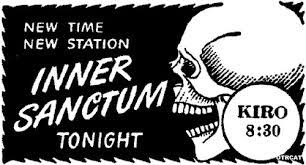 In fact, has the first Silvertip story been written a few years later than it was, when the Ranger's radio show had a national following, I might have theorized that he was influenced by that show. Depending on the list you look at if you do an online search, there were either 10 or 13 Silvertip novels. But whatever the exact number, Jim Silver was popular enough to stick around for awhile. 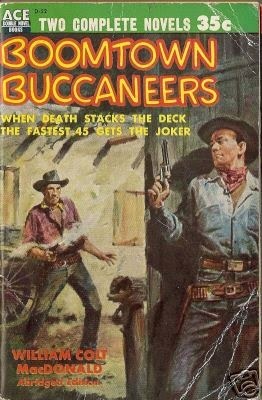 I am a fan of Brand's Westerns and have read a number of them--in fact, I could not recommend the Whistlin' Dan novels highly enough. But I never happened to have read a Silvertip adventure. Then I recently read one of nine comic book adaptations of the novels done by Dell during the 1950s. That got me curious and I found the novel on which it was based at my local library. 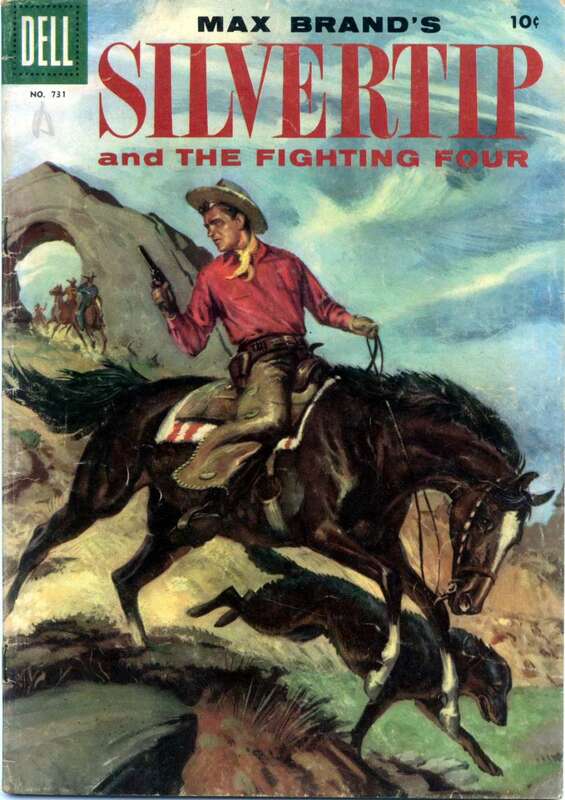 The Fighting Four first appeared in the August 26, 1933 issue of Western Story Magazine, then was published as a novel in 1944. It starts out with a bang--or a gunshot rather--when a bank in the town of Elkdale is robbed and a man killed. The bank's teller--Oliver Wayland--feels responsible because he did nothing to stop the robbers. This is despite the fact that there was clearly nothing he could have done. Three of the robbers are caught. The one who escaped (with a half-million in loot) is supposed to send them a good lawyer. But he opts to keep all the money for himself. His former friends are sentenced to hang, but manage to break prison. They plan to find and kill the fourth guy, who comes up with the idea of finding Jim Silver and (without truthfully explaining all the details) ask for his protection. Meanwhile, Oliver Wayland is also looking for the fourth man and the loot, despite his lack of skill with a gun. He's on a search as much for his self-respect as for the money. Shenanigans ensue. The money changes hands a few times. At the climax, Jim Silver has been badly wounded, the four outlaws have joined together again and Wayland has to decide whether to run for it or stay and protect Silver even against long odds. The Fighting Four is a solidly entertaining book. 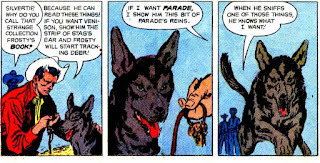 It's easy to see why Brand brought back the man-horse-wolf triumvirate--it is an inherently cool idea that has been revisited (sometimes with a big dog instead of a wolf) by a few non-Brand characters as well. 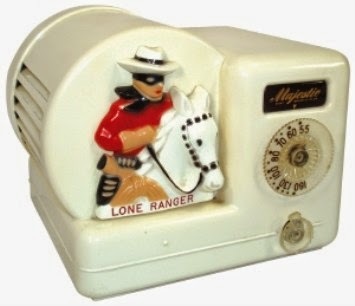 Roy Rogers, Trigger and Bullet, for instance. Or Sgt. Preston, Rex and Yukon King. It's possible that Brand did it first with Whistlin' Dan and other writers were following suit, but I don't know for sure if there is an earlier example. The bad guys in The Fighting Four are interesting characters, especially Phil Bray, their leader. Bray is smart and has no lack of physical courage. He's also intensely loyal to his fellow outlaws, at least as long as they don't double-cross him. (To quote from the novel: "All for one and one for all!" said Bray. He had read that in a book--he forgot where--and he liked the sound of it. It had a special meaning for him.) The sequence in which he is wildly improvising an escape from prison with his two comrades comes close to having you rooting for them. He also isn't bloodthirsty--he'll kill you only if he feels he has to. But he will kill you. Brand strikes a nice balance in Bray's characterization. The outlaw has traits you admire, but in the end he is proof that physical courage without a moral compass is meaningless. 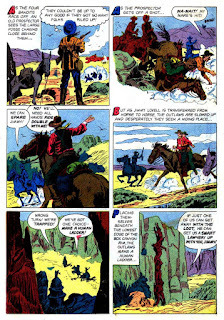 The comic book adaptation (Four Color #731--Oct. 1956) has strong art by Everett Kinstler and is very faithful to the novel. In fact, the plot itself is surprisingly intact after being condensed to fit into 33 pages. Writer Paul S. Newman shortens the prison break sequence considerably and does strip away the characterizations that Brand gave the outlaws in the novel. 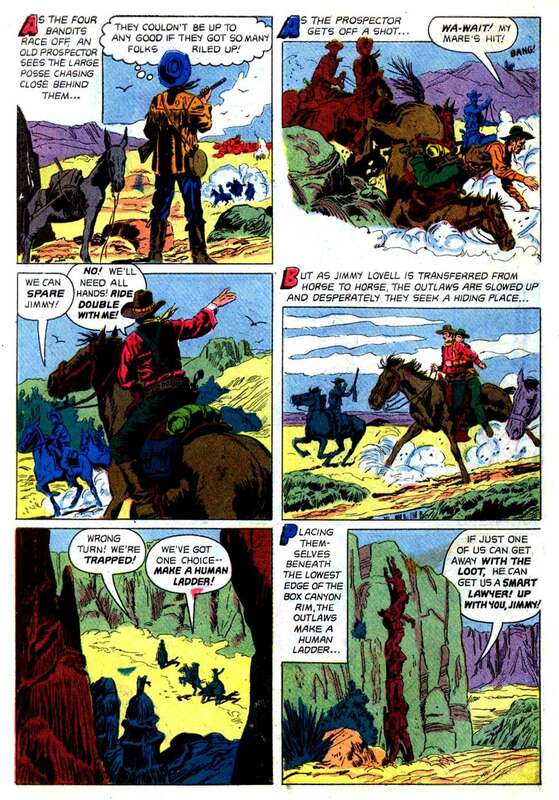 But the other characters are still well defined and the comic book zips along briskly as it gives us yet another version of an entertaining Western. 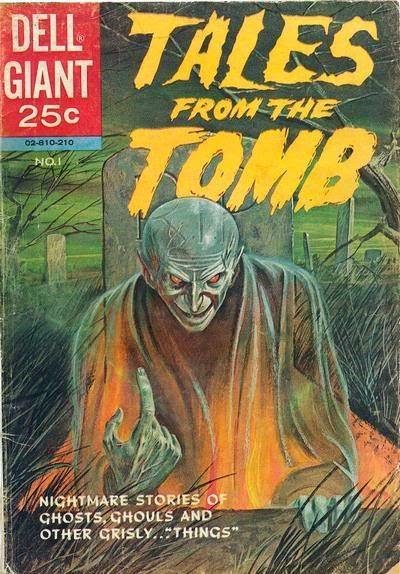 Also, the finale results in significantly fewer corpses than in the novel--almost certainly because the readership of the comic book would be younger than those of the novel. The comic book is available to read online HERE. There is one last fun thing about the novel. The prison break sequence takes place at a state prison equipped with searchlights and machine guns--two things you don't normally see in a traditional Western. The novel never states a year, but both searchlights and machine guns were around by the 1880s, so the time frame can still be well within what we consider to be the Wild West. The comic book story, because it cuts out most of the prison escape, does not show us this. I'm sure the prison escape was cut because that could be easily done without changing the main story. But I wonder how readers of the comic would have reacted if they saw searchlights and machine guns suddenly pop up in a Western. For most of us, our vision of the West is formed by movies and TV shows. But in real life, modern technology did overlap with cowboys and outlaws. Heck, there were telephones and a bowling alley in Tombstone when the Earps and Clantons shot it out near the O.K. Corral in 1882. But if someone made yet another movie about the Earps and put in the bowling alley, I'm pretty sure it would seem jarringly wrong to most of us. Oh, well. Reality is sometimes unrealistic, isn't it? It's gotta be annoying for any writer involved in serial storytelling--regardless of the medium--to have a story suddenly cancelled before you finish wrapping things up. That's happened a number of times in comic books--a series will be cancelled with plot points and character arcs unresolved. Fortunately, when you are working within the boundaries of an established comic book universe, there can be an opportunity to tie up the loose ends of your story in another book. That happened a couple of times in the 1970s within the Marvel Universe. 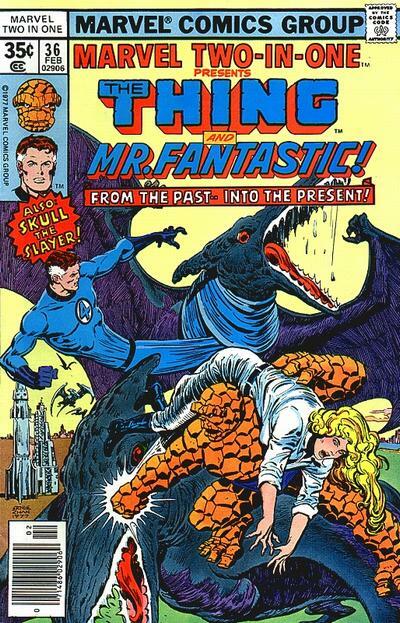 In 1975, Marv Wolfman came up with the really nifty idea of tossing people back in time to the Age of Dinosaurs--through a Bermuda Triangle time portal that has also sent people from other time periods on the same trip. So the heroes not only had dinosaurs to worry about, but cavemen, Aztecs, alien robot Egyptians (it makes sense in context) and other bizarre dangers. I really need to review that alien robot Egyptian story one day. Actually, the book's cool premise is spoiled by having three different writers during its short run, making it very inconsistent in theme and character development. It's largely a missed opportunity and it apparently didn't sell well. It was cancelled after the 8th issue. That by itself was a pity--the cool setting meant there was room for the book to grow into something better. 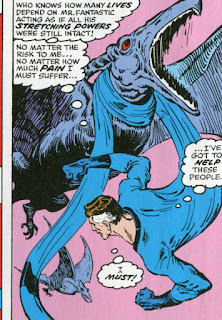 But it was also cancelled at a rather tense moment in the story--with the main characters captured by pterodactyl-riding Aztecs, who planned on giving them starring roles in their next human sacrifice. Fortunately, the Marvel universe is full of people who do things like falling through time portals pretty much all the time. 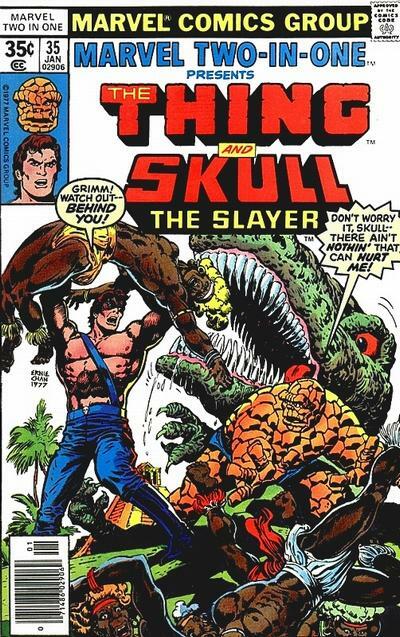 Marvel Two-in-One #35 (January 1978) was written by Marv Wolfman, who used Ben Grimm to finish up Skull's story arc. Ben is asked by the Air Force to test-pilot a new jet. Ben promptly flies into a time portal no one had previously known about and is snatched out of the air by a whopping-big pterodactyl. Ben finds himself stranded in the distant past, but is surprised to discover any number of fellow human beings nearby--including some people who are about to be sacrificed by Aztecs. Well, Ben doesn't "have ta know where I am ta know the diff between the good guys and the bad guys." (I love that line.) He pretty much rips the Aztec temple apart and everyone makes a break for it. They soon come up with a plan--the plane that inadvertently brought Skull and his friends to the past will never fly again, but it might have parts that can be used to repair Ben's plane. A few dinosaurs have to be avoided before the parts are salvaged, but by the time we get a few pages into Marvel Two-in-One #36, the heroes are airborne and flying back through the time portal to Cape Canaveral. Unfortunately, a flight of pterodactyls being ridden by blood-thirsty Aztecs have followed them home. Reed is at the Cape to meet them--he had come down from New York to investigate Ben's disappearance. 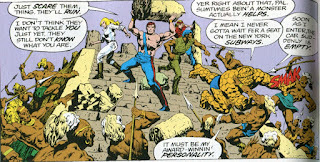 In a Fantastic Four story arc running concurrently with these issues, Reed was losing his stretching powers. 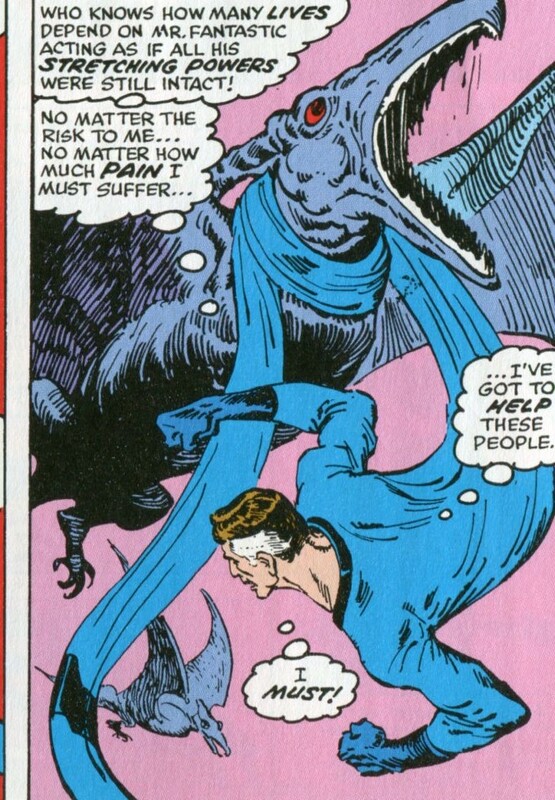 That comes into play here--as he has to endure a lot of pain to make his powers work well-enough to fight off the attacking monsters and protect bystanders. But Reed is not known for giving up when people need him. The pterodactyls are captured and sent off to the Savage Land. I don't know what the heck the authorities did with the Aztecs. So Skull and his friends are home and safe. These two issues plus Skull's own series could now be brought together to form one mostly satisfying story. MTIO #35 & #36 is pretty much one running fight scene, with the heroes jumping from the frying pan into the fire and then into a bigger fire. Except for an awkward but probably necessary flashback to explain who the heck Skull and his friends are, the two-parter is extremely fast-paced. And that's just fine, because it's a truly exciting and well-choreographed tale. Ernie Chan did the pencils and I especially like his dinosaurs--he gives them an otherworldly and dangerous vibe. 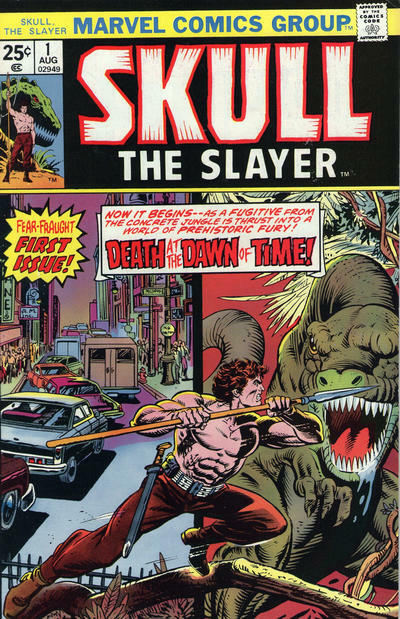 Fans of Skull the Slayer must have been pleased to see the eventually fate of their hero. The ending wraps up character arcs and plot points involving him and his friends in a few lines of dialogue--it can be argued this is a little too abrupt to be completely satisfying, but it's still an honorable conclusion to Skull's adventures. Next week, we'll look at another case when a Marvel hero is borrowed to help end someone else's story arc, when a certain news photographer flies to Los Angeles to cover the dissolution of a short-lived superhero team. My latest ebook--Mystery in the Air: A Review and Episode Guide of the Old-Time Radio Show--is now available for the Kindle and the Kindle App. This one scores a 10.0 on the Creepy Meter.